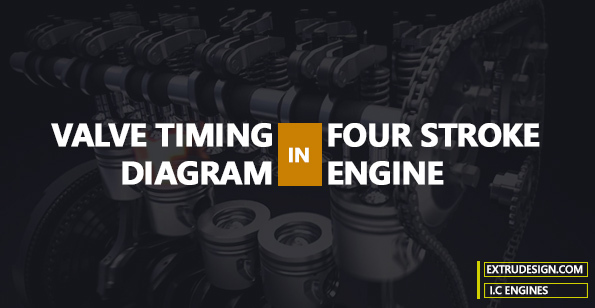 What is Valve Timing diagram in Four-stroke Engines? In the previous articles, we have discussed the Four stroke Diesel engine working principle. But now we are going to discuss the Valve opening and closing timings in the Four stroke engine by drawing a Valve Timing diagram. In Four-stroke engines, the Thermodynamic cycle will be completed in the two revolutions of the crankshaft. Four Stroke Engine uses valves rather than the ports. The above processes will be operated with the sequence of operations of the valves in the Four-stroke engine. 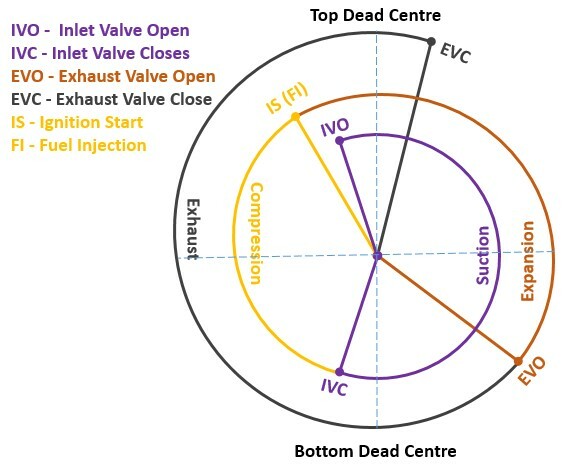 This relation between the valve opening timings to the piston moves from the Top Dead Centre (TDC) to the Bottom Dead Centre (BDC) can be represented on a circle. This is called the Valve Timing Diagram. 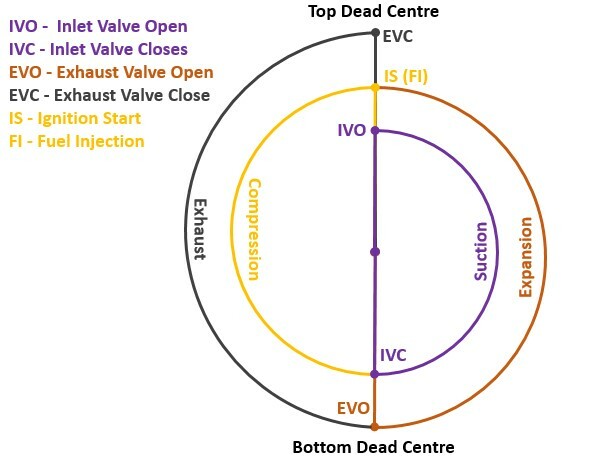 The following theoretical Valve Timing diagram will illustrate how the events such as the Inlet valve and Exhaust Valve are open and closes in an ideal cycle. See the below Theoretical Valve Timing Diagram for the Four-stroke Engine. The above diagram represents the valve timing for the ideal Engine. But in reality, the opening/closing of the valve is not instantaneous as like in the theoretical assumption. The time taken for the opening of these valves needs to be considered. so the Actual or practical Valve Timing Diagram will be slightly different than the above theoretical one. Check this following actual/practical Valve Timing Diagram. Theoretical: In the theoretical Cycle the Inlet Valve will open when the piston is at the Top Dead Center (TDC) and it started moving downwards. Thus the air will be drawn into the cylinder. Actual: In the actual Cycle, the inlet valve will be started opening just before the piston reaching to the Top Dead Center (TDC) from the previous cycle. Because in the actual engine the valve cannot be open instantaneous. so it has to be started opening a bit early. Theoretical: In the theoretical Cycle, on completion of the suction stroke, The compression stroke starts when the piston reaches the Bottom Dead Center (BDC). At this BDC The Inlet Valve will close, and the piston will start to move upward. The Air in the cylinder will be compressed. These two strokes (i.e., suction and compression stroke) complete one revolution of the crankshaft. i.e. 360° of crankshaft rotation. Actual: In the actual Cycle, The inlet valve starts closing right after the piston starts moving upward. Because to close the valve completely, it will take some time. Theoretical: In the theoretical Cycle, when the Piston reaches the Top Dead Center (TDC), Now the fuel is injected into the cylinder by the high-pressure fuel injector at the end of compression stroke. Due to the high compression of the air in the cylinder, the pressure and temperature of the air are increased. Which is sufficient to self-ignite the fuel instantaneously which is injected at the end of the compression Stroke. In which the piston is at the TDC. Actual: In the actual Cycle, the fuel will be injected before the piston reaches to the top dead centre. The ignition starts immediately right after the injection of the fuel into the cylinder. But the reason behind injecting the fuel right before the piston reaches to the TDC is that the fuel complete combustion is not that instantaneous as like in the theoretical assumption. So it has to start burning before the piston reaches to the TDC. That is the way we can take the full advantage of the power stroke. Theoretical: In the theoretical Cycle, the expansion stroke has to start when the piston reaches the Bottom Dead Center (BDC) due to the power stroke. At the BDC the exhaust valve will open, all the combustion particles will be thrown out of the cylinder with piston upward movement. Once the Piston reaches the Top dead centre, all the combustion particles will be thrown out of the cylinder completely and the suction stroke will start again for the second cycle. Actual: In the actual cycle, the Exhaust stroke will start a bit early as before piston reaches the Bottom dead centre (BDC). And the Exhaust valve closing should be maintained properly or otherwise, there is a chance of Exhaust Blowdown. Which means the useful amount of power generated during the power stroke will be lost due to the early opening of the exhaust valves. This is how the valve opening and closing action sequences are arranged in a Four Stroke Diesel Engine. A well-tuned Valve timing diagram will result in the better performance of the engine. similarly, if the engine Valve timing is not set correctly there is an exhaust blown or incomplete combustion. this will lead to the bad performance of the engine. We have discussed the valve timing diagram for the Four-Stroke Diesel Engine only. For the Four-stroke Petrol Engine also we can draw valve timing. Everything will be the same as this valve timing except the fuel ignition principle. In Four-stroke petrol Engine, we use the Air-Fuel mixture and spark plug for the combustion process. The rest is the same. But for a two-stroke Engine, we will have a Port Timing Diagram. If you have any thoughts on this topic, Please let us know in the comment section below.